Pace® Picante Sauce: What I love about Pace Salsa is that it provides a variety of options to add to your meal rotation. Pace® Picante Sauce adds a kick of flavor that never disappoints to snacking and meals. It has a genuine South West flavor that everyone loves. V8® Fusion® + Energy (Aisle 15): V8 + Energy is a good alternative to the unhealthy options your kids are currently grabbing to get through the day (soda, coffee, snacks). V8 + Energy is a great way to help achieve a healthy lifestyle, while still being an easy option to grab and go. It tastes like fruit, it's nutritious, offering a combined serving of fruit and vegetables (only 50 calories per 8oz serving) and most important is a refreshing energy drink powered by natural green tea. 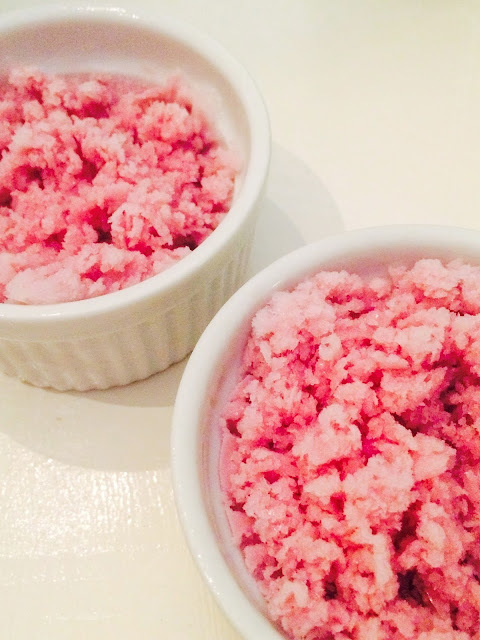 I have a recipe for an energy cream based sorbet using V8® Fusion® + Energy that will blown your mind because of how easy it is (no ice cream machine required). 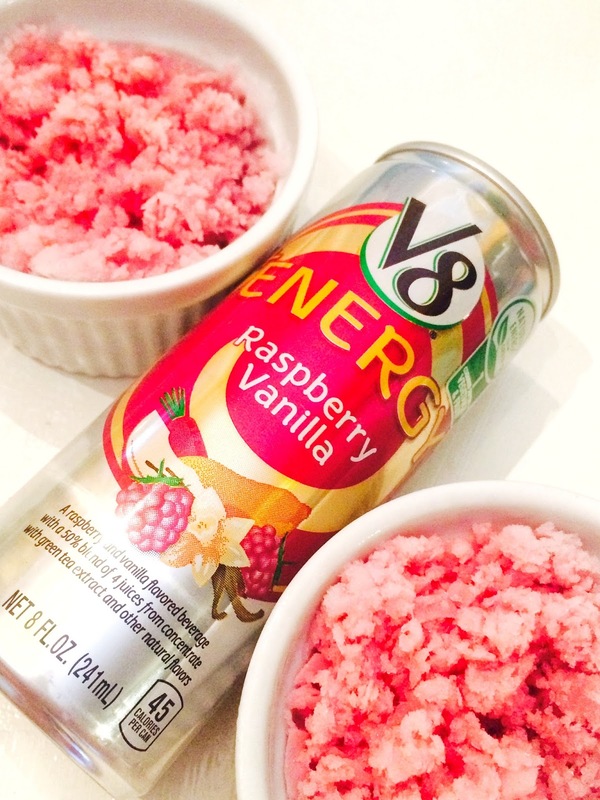 In our recipe we use V8® Fusion® + Energy in Raspberry Vanilla and it gives the sorbet a great taste. Because we also use sweet condensed milk in our recipe the best way I can describe the flavor is that it will taste like a raspberry cheesecake. It reminds me of the "mantecado y frambuesa piraguas" or "raspados de nieve" (snow cones) back in Puerto Rico. So good!! Campbell’s® Chicken Noodle Soups. Soups that taste great and nourish the entire family. 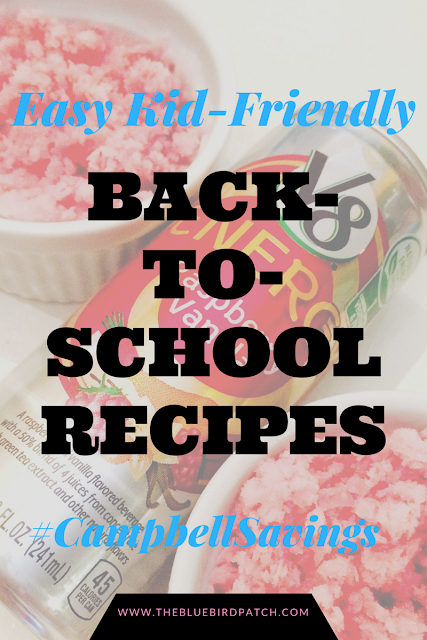 You can put your own twist and add your favorite garnishes to make it special for YOUR family. I love adding sliced avocados and a touch of fresh lemon juice!! My kids go above that and topped it with those tortilla strips you use for salads, yum! 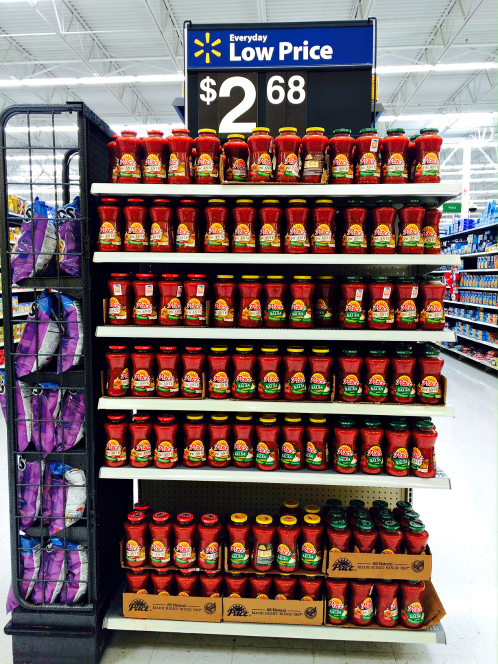 The sweet + savory Italian American flavor of Prego® Italian Sauces (Aisle 11). The better tasting Italian Pasta sauce. A familiar and comforting sauce to serve your family, that you know they will like every time. I like to simmer my meatballs in Prego® sauce instead of frying them of putting them in the oven. 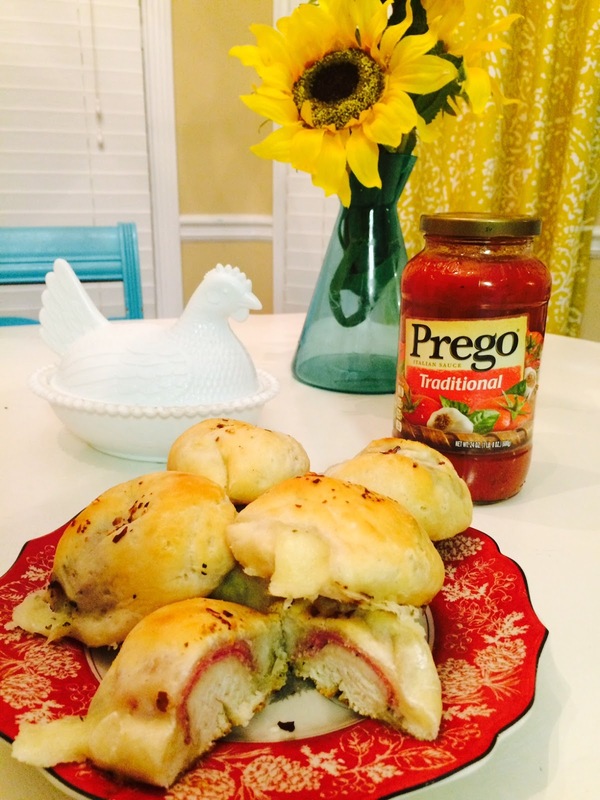 Continue reading below and check out our kid friendly recipe using the traditional Prego® Italian Sauce that can be prepared days ahead to help you save time! 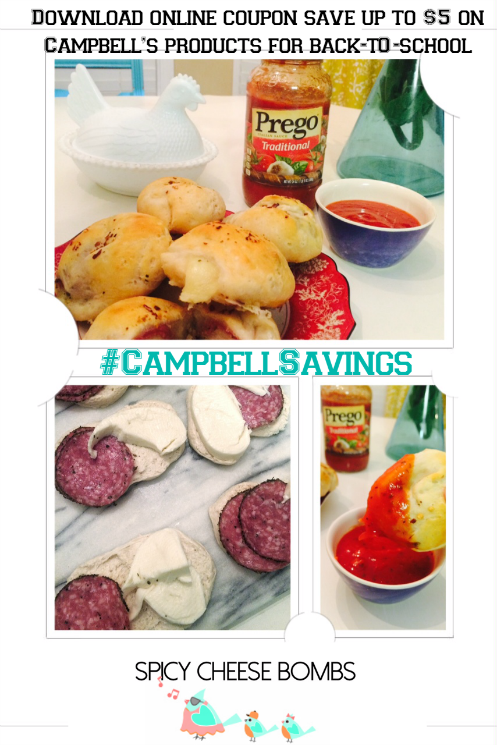 All Campbell’s products will be on discount via an online coupon, and if you download all of them, you can save up to $5 on Campbell's products. Preheat oven at 350 F. Line a baking sheet with parchment paper. 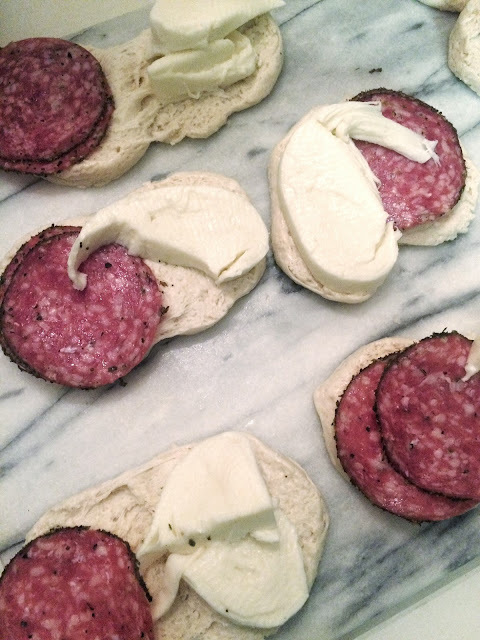 Dust working surface with flour, butterfly biscuit dough and add a generous amount of Mozzarella cheese and dry curated Italian salami. Wrap the dough around the cheese and salami. Make sure edges are tightly seal and gently proceed to form a ball and place in the baking sheet. Bake until 13-18 minutes until golden brown. Once they bake brush the top with melted butter, spicy garlic seasoning and red pepper flakes. Combine ingredients in the blender and mix for 5 seconds. Pour mixture in individual molds and freeze overnight. If you can't find blood orange sparkling juice, you can always use lime-soda instead. Scrape the sorbet with a fork to fluff and serve immediately.